1880s-1890 autograph album of Alice Frances (Bliss) Rathburn of Pawtucket, Rhode Island, who later lived at Gardner, Massachusetts. Most of the inscriptions came from or near these two places. 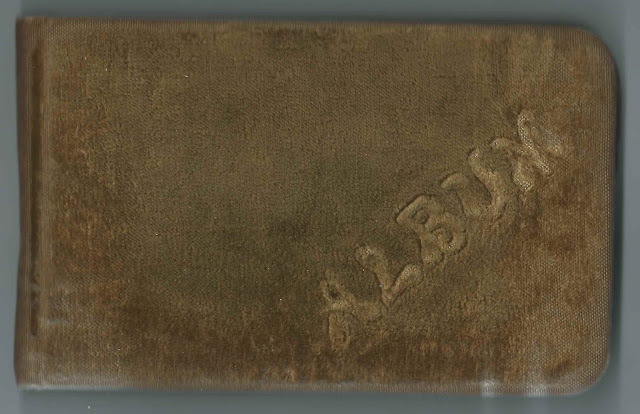 The album measures approximately 7" by 4-1/4" and contains the sentiments of 29 of Alice's friends and her pastor, J. J. Woolley and his wife. An alphabetical list of the inscribers, together with any personal information they offered, appears at the end of this post. About 1885, according to an entry in the 1900 Census of Gardner, Massachusetts, Alice Frances Bliss married Christopher Columbus Rathburn, son of John Mott Rathburn and Sarah Ann (Foster) Rathburn. 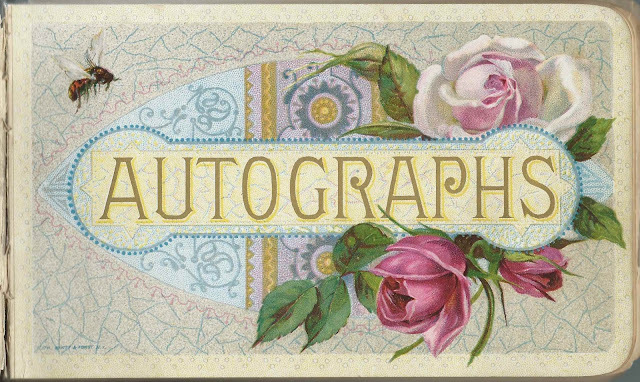 Alice and Christopher lived at Gardner, Massachusetts, where many of the inscriptions were collected. They had at least two children. Christopher died in 1937 and Alice in 1954. They buried with their son Carl and members of Christopher's family in the Crystal Lake Cemetery at Gardner, Massachusetts. Eugene Garrett of Pawtucket, Rhode Island; inscribed on February 23, 1885. His wife Almira Russell (Carpenter) Garrett inscribed the right facing page. 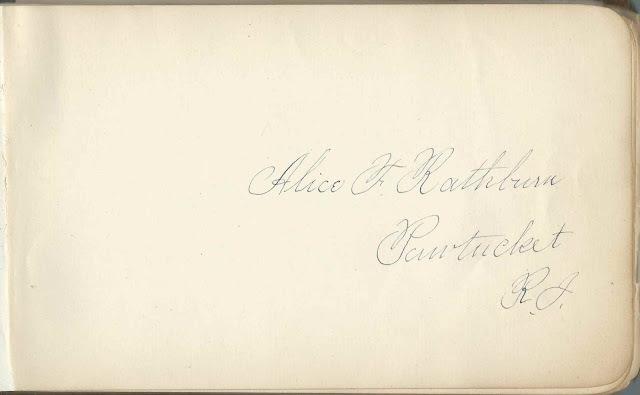 Mrs. Eugene Garrett of Pawtucket, Rhode Island; inscribed on February 23, 1885. Presumably Almira Russell (Carpenter) Garrett, wife of Eugene Garrett, who inscribed the left facing page. Edgar Spears of Central Falls, Rhode Island; inscribed on March 28, 1884. 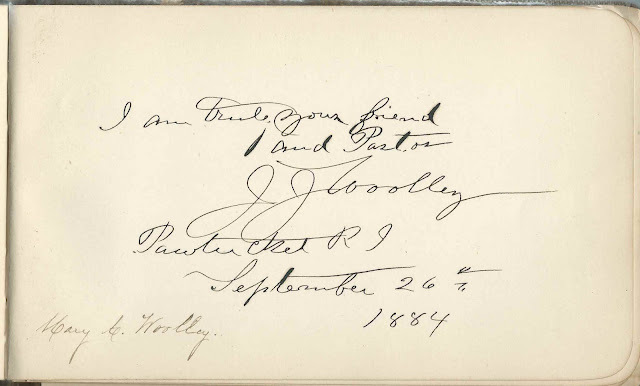 His wife, Mary Alice (Evans) Spears, inscribed the left facing page. Mary A. Spears of Central Falls, Rhode Island; inscribed on March 28, 1884. She was Mary Alice (Evans) Spears, whose husband Edgar Spears inscribed the right facing page.